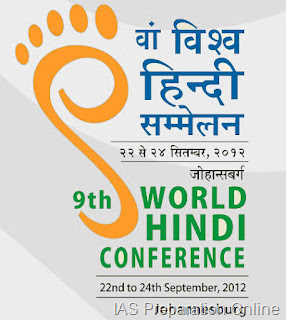 The Ministry of External Affairs, Government of India with the support of Hindi Shiksha Sangh, South Africa and other stakeholders is organizing the Ninth World Hindi Conference [WHC] in Johannesburg, South Africa from 22-24 September, 2012. The Conference will be held at Johannesburg, South Africa. The tradition of the World Hindi Conferences began with the first conference having been organized in Nagpur in the year 1975. Since then, these conferences have achieved a global profile and momentum of their own. The subsequent eight World Hindi Conferences were organized in different world cities, namely, twice in Port Louis (Mauritius), twice in India, Port of Spain (Trinidad and Tobago), London (UK), Paramaribo (Suriname) and New York (USA). All these conferences have always attracted a galaxy of renowned scholars and followers of Hindi. In keeping with this growing reach and popularity of this event, the Government has decided to organize the next conference in Johannesburg, South Africa, which would also be an apt recognition of India’s historic, close and growing ties with the whole of the African continent. South Africa also carries the profound memories of Mahatma Gandhi’s association with that region. The 9th World Hindi Conference would deliberate on a series of traditional and contemporary themes related with both classical and modern aspects of Hindi. The theme of the conference this year will be “Bhasha ki Asmita Aur Hindi Ka Vaishvik Sandarbh”. The conference would also have nine academic sessions on such subjects as Mahatma Gandhi’s linguistic vision; Hindi and modern technology; role of Indian epics in propagation of Hindi; contribution of foreign scholars in dissemination of Hindi; Mass media and Hindi, etc. The main theme of the conference is ‘Bhasha Ki Asmita Aur Hindi Ka Vaishvik Sandarbh’. Related Topics Chettikulangara Kumbha Bharani Kettukazhcha.